A cormous perennial with many, narrowly sword-shaped leaves to 15cm and a zigzag stem, to 45cm, bearing many green flowers in summer. [RHSE, Grey]. ‘We are indebted to Messrs. Lee and Kennedy for the opportunity of giving this rare and curious vegetable [Tritonia viridis]. Introduced into Kew Gardens from the Cape of Good Hope by Mr. Masson. Flowered there in 1788.’ [BM t.1275/1810]. Listed in all published catalogues [B.169/1843]. 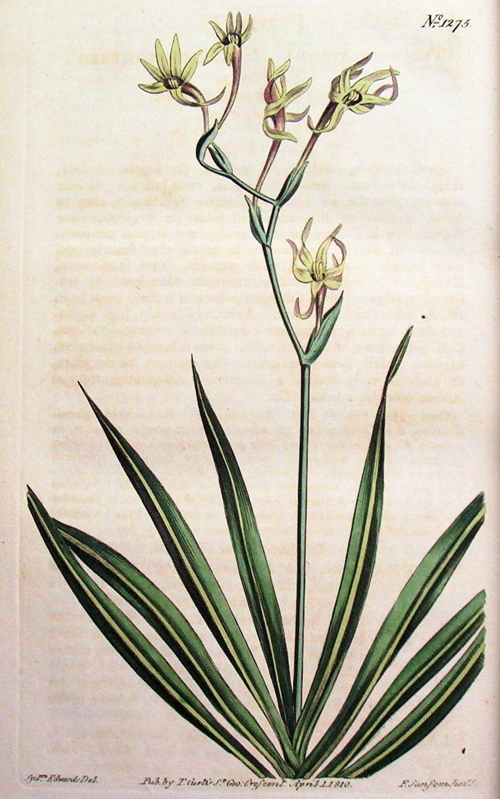 Possibly the plant received per ‘Sovereign’ February 1831 as Ixia viridis [MP A2948-2], although this name is usually applied to Ixia viridis Thunb., a synonym of Ixia viridiflora Lam. which see. 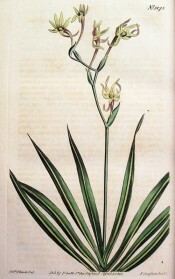 A possible but less likely identification is the plant described in The Gardeners Chronicle as Gladiolus viridis, a ‘member of the Gandavensis or Floribunda tribe’ [Gard. Chron. 1851]. Its relationship to Anometheca viridis is uncertain. Macarthur’s viridis was probably introduced too early to be this hybrid, particularly if it is the plant received per ‘Sovereign’. For a description of these hybrids see Gladiolus x gandavensis Van Houtte.